Posted on Saturday, April 26th, 2014 at 5:58 pm. 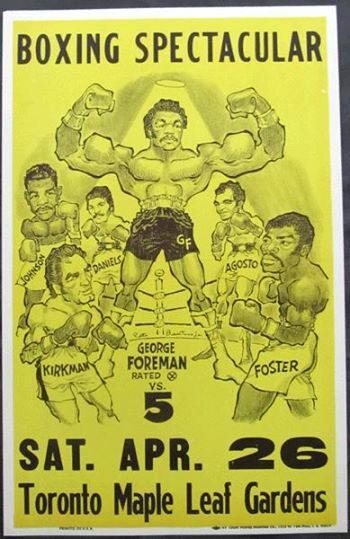 Boxing History: April 26, 1975 George Foreman fights 5-exhibition fights in one night! George Foreman, returning to a ring for the first time since his shocking KO loss to Muhammad Ali, staged a most unusual boxing exhibition. But any ideas George may have had about restoring his sense of invincibility came to virtually nothing when the action commenced in Toronto, Canada. With Ali, the man who had so humbled him six months earlier, serving as guest commentator with Cosell, the exhibition was turned into a bad joke. Ali heckled the man he had beaten to regain the world title, relentlessly. And George, though he won all five bouts, three by stoppage, did not look particularly menacing. 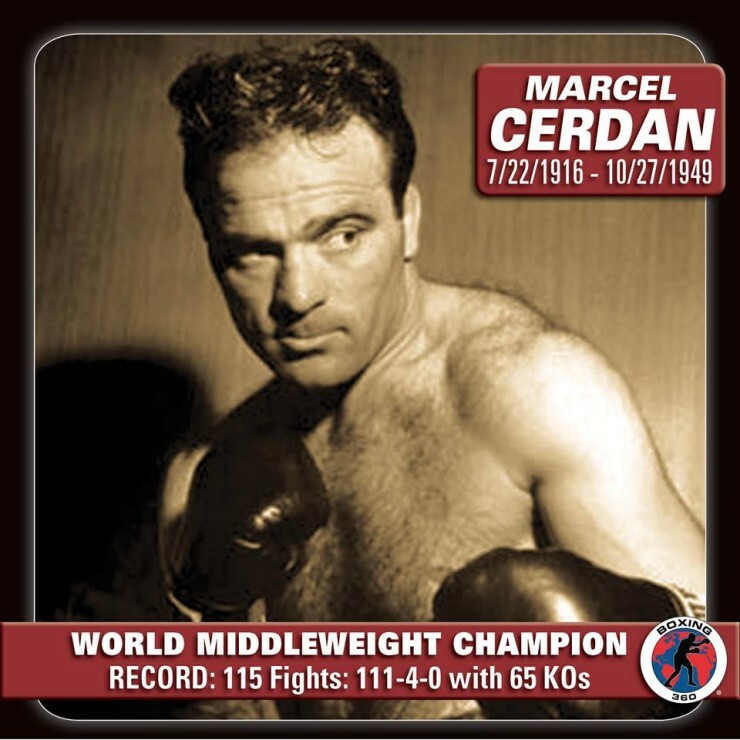 He had weighed in at a hefty looking 232 pounds – almost 14lbs over his then ideal fighting weight – and he looked accordingly sluggish. And as far as George’s intimidation level being restored, this too failed to occur. The five men opposing him actually joined in with the taunting. One of the boxers, Jerry Judge, even went as far as kissing Foreman on the cheek as the former ruler attempted to engage him with his baleful stare. As much as this must have angered Big George, Judge spoke to him during the action as well, telling the future legend that he couldn’t hit hard! The other four men; Charley Polite, Boone Kirkman, Alonzo Johnson and former Joe Frazier opponent Terry Daniels, were not quite as cheeky, but the damage had been done. Damage to Foreman’s already shaken confidence and damage to his dignity. The whole show had been pretty much an embarrassment, as Cosell was only too keen to inform the viewing audience. Years later, however, when very much loved and respected by all, George said he felt the idea had been one he was still pleased he’d had. The problem with the exhibition’s lack of seriousness had been mostly due to Howard’s overwhelming desire to make the whole thing a farce, Foreman argued. Had he commentated in a more respectful manner, and had Ali not been invited to make cracks at every opportunity, the event might have had a chance. He may have a point. But whatever the case, the negativity of the thing far outweighed the positive. After the jeers and laughter had ended there followed a long absence from the ring for George. Only after nine months had passed would he fight again – this time for real. 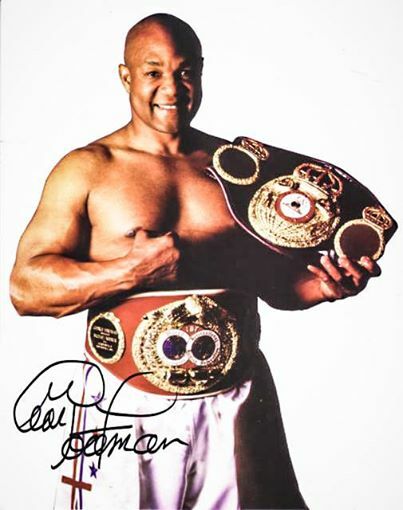 Well over a year after his eight round KO loss to “The Greatest,” George fought the huge Ron Lyle. An unbelievable and brutal slugfest ensued. And though he was knocked down twice, Foreman got back up and flattened Lyle in round five. This display of heart and courage did far more to restore his respect as a fighter than anything he did in his Toronto exhibition. An exhibition that took place thirty-nine years ago today. — with Reaver Hickman and 4 others.